Most people have heard of white gold today. However, a lot of people find the concept of white gold confusing. They might not understand what makes this gold distinct. However, white gold is truly different from other types of gold. Obviously, white gold has a distinctive look. Some people might assume that white gold looks just like yellow gold. However, white gold actually looks like silver. When looking at it for the first time, some people might think that it is silver. With white gold, people will get many of the benefits associated with both gold and silver. White gold is not pure gold. It usually consists of gold and an additional metal. The additional metal types will vary. Nickel is one of the most popular choices. Palladium is also used frequently. In some cases, people will find white gold that contains manganese. White gold can also contain zinc. In many cases, white gold will be stronger than other types of gold. When the white gold is made with nickel, the effect is particularly pronounced. However, white gold generally tends to be very strong. People should never handle their jewellery too roughly. However, they still won’t have to be delicate when wearing their white gold rings. Scratching white gold is comparatively difficult. White gold will not develop imperfections very easily. One of the great things about white gold jewellery is that it is relatively easy to restore. White gold jewellery is tough. However, it will still develop marks eventually. There is only so much that people can do to prevent that. However, fixing the scratches on white gold jewellery is comparatively simple. Sometimes, just using polish in the right way will work. People usually won’t get the same results with yellow gold. They will basically wear down the yellow gold when they are trying to polish it. The softness of gold has shaped its entire history. It certainly makes gold more vulnerable. The fact that white gold is not pure gold has some clear benefits. Some people might be allergic to gold. However, this is a relatively rare allergy. People who buy yellow gold rings won’t usually have to worry about their allergies. However, this might genuinely be a problem when it comes to white gold. Even yellow gold can contain nickel. Still, the nickel content of white gold will tend to be more problematic. Being allergic to nickel is very common. Making earrings without nickel is standard today. Even people who don’t have nickel allergies might buy jewellery like this. Jewellery like this is everywhere. Still, nickel is used frequently in white gold. People who have nickel allergies can still enjoy white gold rings. However, they will have to shop for white gold rings made with manganese or palladium. This might require careful shopping. 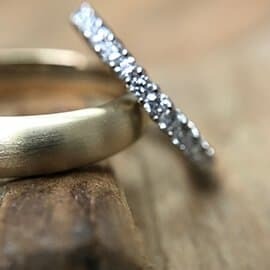 White gold and yellow gold are both gorgeous. They have some notable differences. However, one type of gold is not better than the other. People can choose the type of gold that will work for them.